Kevin will be hosting a Citizenship in the World Merit Badge Clinic. September 27th form 1 p.m. to 5:30 p.m. at the fire station. 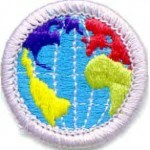 This is an Eagle required Meritbadge, so it is a great opportunity to earn it.